Cowes Classics Week is back once again in July 2017 with a newly branded sponsor title- Charles Stanley Direct- a new division of Charles Stanley. 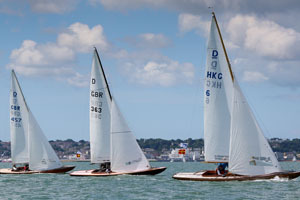 Classics include a number of 6 metres while a strong showing of Darings, Solent Sunbeams and Swallows and Bembridge One Designs will all be attending the five day event (or four for some classes) which starts at Cowes on 17 July. In addition, the XOD class, which regularly musters over 50 entries, is expected to be the largest fleet once again and the Vintage Dragon class, which made its first appearance last year, looks to be increasing in numbers. The Flying Fifteen class will be celebrating its 70th year with an anniversary race on Monday 17th July. Handicap fleets will include Old Gaffers, SCODs, Twisters, Vintage Swans and a historic assortment of other yachts whose design pedigrees date back to 1975 or before. A handful, incredibly, were built in the nineteenth century and are still racing regularly. Several majestic 8 metres are also indicating that they will take part. In addition the Seaview Mermaids and National Squibs will be appearing for one day each during the event. Spirit of Tradition yachts, more recently introduced and providing they are to a classic design, such as the Rustler and Tofinou, also compete in their own class. The Royal Ocean Racing Club, Royal Victoria Yacht Club, Cowes Corinthian Yacht Club and Island Sailing Club are all supporting the Royal London YC in organising the event. During the first ten years of the event the Royal London has built up an enviable reputation for international level race management, good courses and fast results, no mean feat considering that racing is underway each day on five separate race courses.